Over 1500 Bradley Manning flyers were distributed at the London anti-cuts demo on Saturday 26 March. 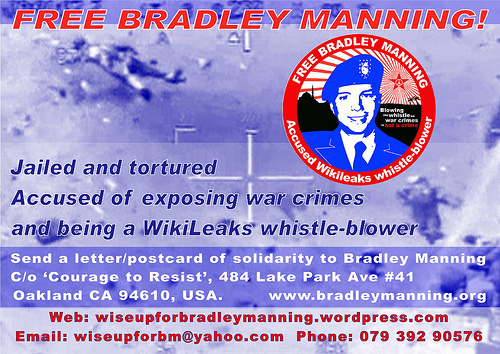 One side of the flyer gives basic information about how to send a solidarity letter or card to Bradley Manning, along with web links, emails etc. 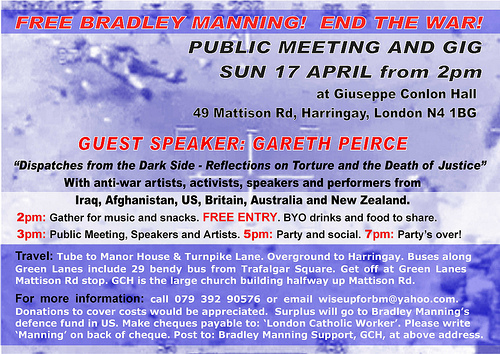 The other side of the flyer has information about a solidarity event to be held in London on 17 April for Bradley Manning, speakers to include Gareth Peirce and others. Background report and call-out here. Reports on leafleting at the demo here and here.